Generating and executing great ideas is the key to staying ahead in a rapidly changing world. It seems so basic. Why is it so hard to actually get right? According to innovation expert Phil McKinney, the real problem is that we’re teaching people to ask the wrong questions about their businesses--or none at all. There has to be a better way. What are the rules and assumptions my industry operates under? What if the opposite were true? What will be the buying criteria used by my customer in 5 years? What are my unshakable beliefs about what my customers want? Who uses my product in ways I never anticipated? These questions will reframe the way you see your products, your customers, and the way the two interact. Whether you're a company of thousands or a lean startup, Beyond the Obvious will give you the skills and easy-to-follow plan you need to make both the revolutionary changes and nuanced tweaks required for success. "Human beings are creatures of habit, so getting ourselves and our teams to think beyond the obvious is a challenge we face all the time. Phil McKinney is an innovation expert, and his killer questions and hit-the-spot anecdotes provide a great way to get out in front of opportunities we otherwise won't see." "I've always believed that asking the right questions is the essence of design. 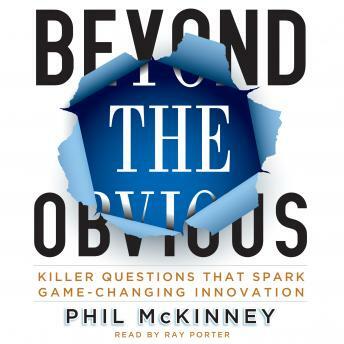 Phil McKinney proves that point with this wonderful set of killer questions that will jumpstart—or greatly enhance— your innovation efforts." --B. Joseph Pine II, co-author, The Experience Economy & Infinite Possibility. "Product Innovation is a prerequisite to building great brands. Phil's questions are a prerequisite to building innovative products."